1. It’s easier to design and build a Ferrari than a Ford. 2. Low-end disruption happened early in the adoption curve. 3. Almost all meaningful innovation occurs in the production system (not the vehicle). 4. To understand how cars will or won’t change, study roads. 5. There has never been a disruption based on drivetrain innovation. 6. China is the largest production (and consuming) nation. 7. Almost all car companies own each other. 8. For most motorists, congestion is a bigger problem than any vehicle deficiency. 9. Contract manufacturing is nearly non-existent. 10. It’s easier to make a car go fast than to make it go far. Almost all meaningful innovation occurs in the production system (not the vehicle). The improvements in vehicles are many but they have not been meaningful in the sense of shifting any of the power in the industry. Certainly not to new companies. The production system innovations of Ford, GM and Toyota allowed them to establish what is to date an unassailable power base of production. If you want to find the next “big thing” in automobiles, look for a new production system. 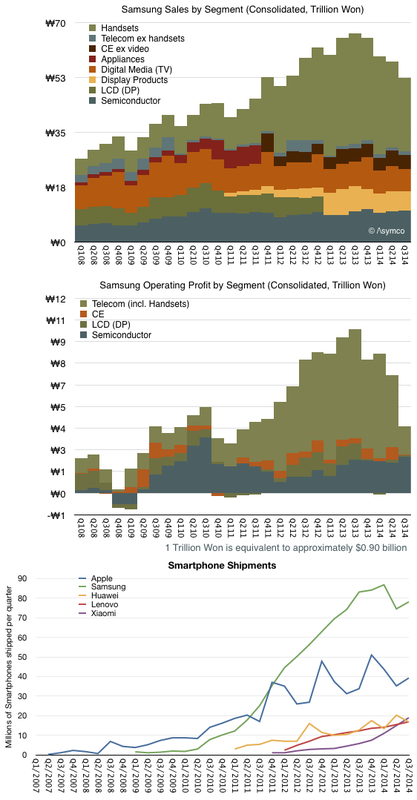 Samsung’s operating model seems to be to invest as a ‘fast follower’ filling in the market after it’s established while leveraging capital intensive components synergies… If the modus operandi does not change then their turnaround will depend on the creation of new opportunities/categories. The march of time is inexorable. 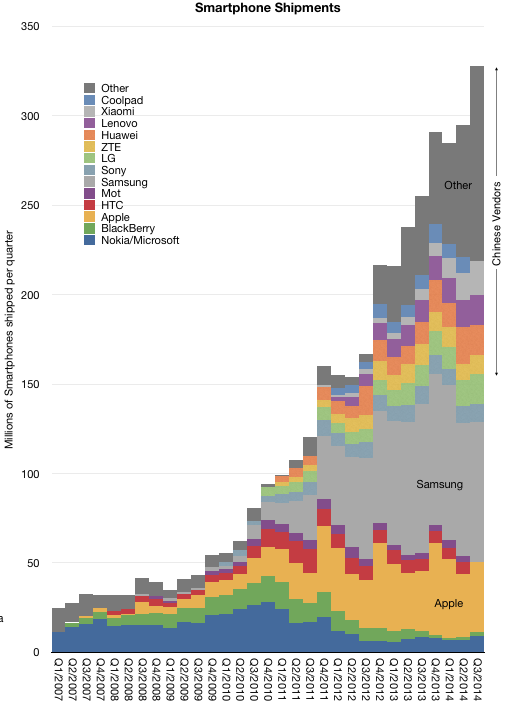 Product by product, keynote by keynote, we are seeing the post-Steve Jobs Apple emerge. The “This never would have happened if Jobs were still around” vein of Apple punditry will be with us for decades to come. Most of it is deeply misguided. But some of it rings true. 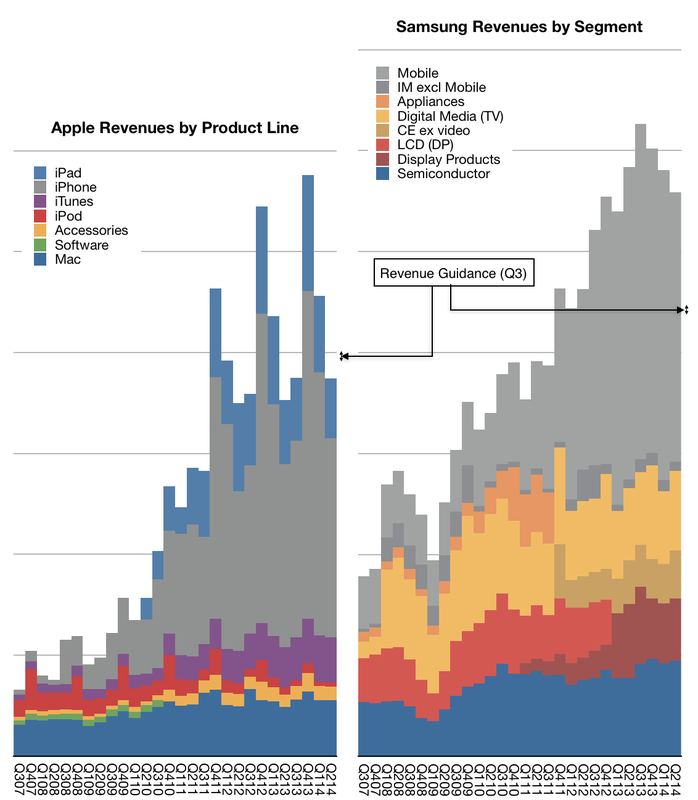 Apple today is a different company than it would be if Jobs were still there. No one denies this, inside or outside the company. But what are those differences? I’m going to go out on a limb and name one: iOS 7. I’m not going to pretend to know Jobs’s taste — no one could, that’s what made Steve Jobs Steve Jobs — but I can certainly make a guess, and my guess is that he would not have supported this direction. I don’t think I’m saying anything here we haven’t all thought, regardless what we each think of the iOS 7 look and feel individually. This is neither damning nor praising iOS 7. But I do think it’s a tangible sign that Tim Cook means it when he says that Jobs’s advice to him was never to ask “What would Steve have done?” but instead to simply ask “What is best for Apple?” and judge for himself. But the hardware Apple showed Tuesday — everything from the assembled-in-the-USA Mac Pro to the new iPads — that, I think Steve Jobs would have simply loved. Apple has pulled off some major engineering and design advances. Jobs took inordinate pride when he unveiled the A4 system-on-a-chip during the introduction of the original iPad in 2010. Doing custom silicon in-house was a new direction for Apple, and they’ve continually upped their efforts in this regard. Each successive generation — A5, A6, A7 — has been more customized, and less like the off-the-shelf chipsets and components used by competing device makers. In short, Apple’s chip design team is firing on all cylinders. How did the iPad Air get so much thinner and lighter in just one year? How did the iPad Mini gain a retina display and quadruple in performance with almost no increase in weight to accommodate a larger battery in just one year? The answer to both questions is the same: the A7. The A7 is an “only Apple could do this” piece of technology, and Jobs would have exulted in it. And I keep thinking about this old video from 1990 of a NeXT computer factory in California, “The Machine to Build the Machines”. Watch that, then read this brief piece from Fortune back at the same time, and it’s pretty hard not to see Apple’s new assembled-in-USA Mac Pro as the culmination of the same dream. I doubt the Mac Pro is the only product Apple wants to assemble like this.